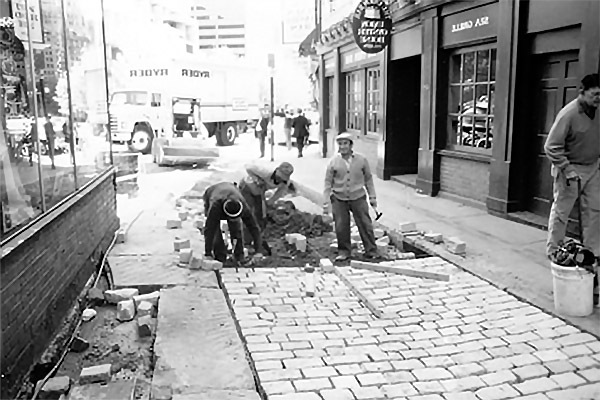 The Blackstone Block, near Faneuil Hall and Quincy Market, is the last location in Boston with remnants of the city’s original street pattern, including a 17th-century lane no more than six feet wide, as well as the Boston Stone and a house once owned by John Hancock. The old streets were restored and narrow allyways made accessible, and patterns of cobblestones, granite slabs, and bricks were used to indicate original street and building locations. Historic street lamps were found in a scrap metal yard, restored, and fitted with energy-saving lights. New street signs, historic markers, and a kiosk with text and photos identify and explain the history of the block.